On the 1st of Jan, 2015 a youth from Kalimpong, Bivek Rasaili was stabbed to death during a fight in Tribeni which we had reported here [ A 22-year-old student from Homes area here died today after he was stabbed during a scuffle between two groups of picnickers at Tribeni. One person, known to be a friend of the attacker, was thrashed and has been taken to a Siliguri hospital. Sources said Vivek Rasailey had been stabbed during the scuffle around 4pm today. Vivek's friends tried to catch the alleged attacker but he fled. The youths then caught hold of the attacker's friend and thrashed him. Vivek, a third year B.Com student of Kalimpong College, succumbed to his injuries on the way to Kalimpong subdivisional hospital ]. 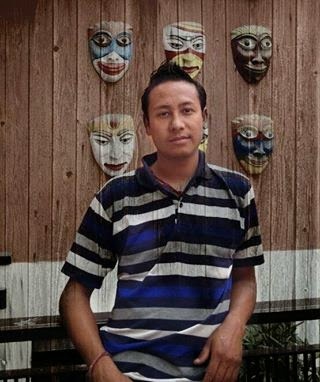 It turned out that Bivek was the President of Gorkha National Students Front (GNSF) for the Kalimpong sub-division. Following the murder, GNLF has demanded a high level inquiry into the killing, as Bivek was highly placed within GNLF Youth and his death is being seen as a conspiracy to silence the voice of dissent in the hills. The police have already arrested the main accused Amir Rasaily, but GNLF cadres worry that a greater conspiracy to silence a leading GNLF youth leader could be hidden behind a mundane new year fight. They have threatened that if the 'mastermind' is not arrested, they will call for a 12 hour Darjeeling bandh.